Society will collapse in days… And that’s the good news. 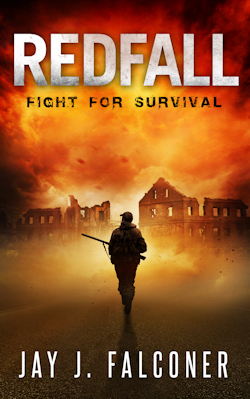 Former Special Ops and survivalist Simon Redfall has lost everything: his wife, his fortune, and his future. Despite being hunted by angry mobs and his own bankrupt government, Simon arrives in Washington, DC to attend the first ever, pay-per-view execution of someone he loves. Then red storm clouds appear and begin to spread their potentially toxic rain across the planet. The mysterious weather phenomenon grounds all travelers, knocks out communications, and threatens to take down the grid, sending civilization back to the Stone Age. As society tumbles into chaos, Simon joins a group of like-minded preppers to unlock the secrets behind a terrifying global conspiracy. What he and his band of freedom fighters soon learn will put their lives at risk, and the lives of everyone else on the planet.